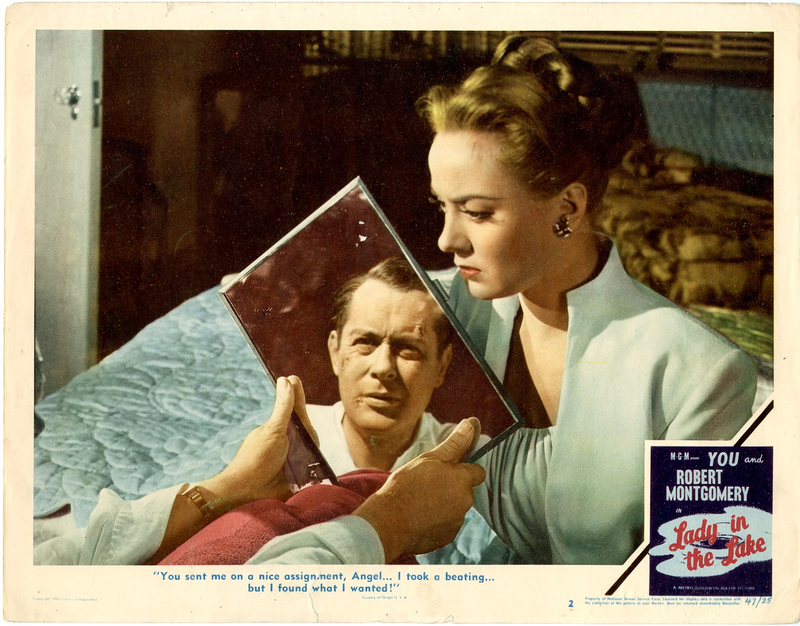 Today, I'm reviewing Lady in the Lake, starring Robert Montgomery and Audrey Totter, which is one of the most unusual films noir ever made. This review is part of the 1947 blogathon hosted by The Dark Pages and Speakeasy. 1947 was a great year for film noir. There was Jacques Tourneur's masterpiece Out of the Past, the bizarre horror/noir mashup Nightmare Alley, and Orson Welles hall of mirrors thriller The Lady from Shanghai. 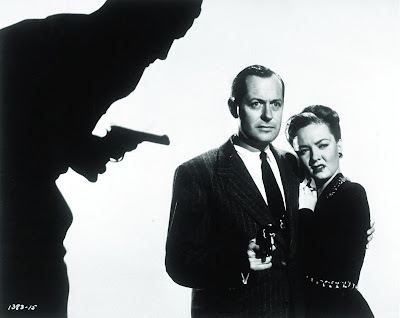 Director and star Robert Montgomery made two interesting noirs in 1947. Ride the Pink Horse is a great film located in the American Southwest, while the picture I'm looking at today is Lady in the Lake, which is remarkable for its use of the subjective camera technique, meaning the audience sees the action through the eyes of the main character. Lady in the Lake, based on Raymond Chandler's 1943 novel, follows private detective Phillip Marlowe (unlike the Chandler novels, Montgomery spells Phillip with two "'ll' s") as he investigates the disappearance of the wife of a powerful publisher (Leon Ames) during the Christmas season. 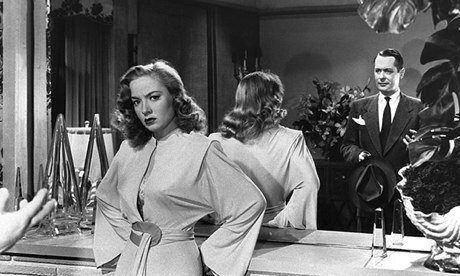 The plot of Lady in the Lake is fairly standard; in fact, Chandler was so disappointed by the adaptation of his novel that he asked that his name be removed from the credits. Instead, Lady in the Lake draws the audience's interest through Montgomery's directing style. A French poster for Lady in the Lake (1947). Montgomery came to Hollywood in the late 1920s, and his good looks and easy charm quickly earned him a top spot at MGM as a romantic leading man and matinee idol. Montgomery took a break from acting to serve in the U.S. Navy during World War II, where he participated in the D-Day invasion and rose to the rank of lieutenant commander. Montgomery's first film after the war was They Were Expendable (1945), a great movie directed by John Ford about a PT boat crew stationed in the Philippines. Montgomery helped direct the movie after Ford broke his leg, and two years later MGM let him helm Lady in the Lake, his first official movie as both director and star. Detective Phillip Marlowe (Robert Montgomery) is shown in a mirror interviewing Adrienne Fromsett (Audrey Totter) in Lady in the Lake (1947). Chandler wrote all of the Marlowe novels in the first person, and Montgomery wanted to recreate that experience in Lady in the Lake. Montgomery as Marlowe opens the film by setting up the complicated story for the audience, but after that he is basically heard and not seen for the rest of the movie. Marlowe does pop up in front of the camera a few more times, and you can see his reflection in a few mirror scenes, but mostly the audience just hears him speak while the other characters address the camera as if they were speaking to Marlowe. Montgomery and cinematographer Paul Vogel used quite a few innovative techniques to make the film. John Arnold, head of MGM's camera department, made a mobile dolly so the camera could move more freely, and Arnold also designed a shoulder brace so the cameraman could realistically participate in a fistfight while still filming, according to the American Film Institute notes. A vintage lobby card for Lady in the Lake (1947). Despite these innovations, the subjective camera technique doesn't really work in Lady in the Lake. While it is extremely effective in some scenes, especially a sequence where Marlowe is involved in a car accident, Montgomery's choice to use it throughout the entire film is a mistake. Montgomery basically uses the camera as a substitute for the human eye -- when Marlowe turns his head the camera turns also -- which makes for some shaky camera movements that are usually associated with low-budget horror movies. Also, cinema is an art form that is based on the human face, and when the main character is a disembodied voice, that's a problem. Dark Passage, another 1947 noir directed by Delmer Daves and starring Humphrey Bogart and Lauren Bacall, is a better film that uses the subjective camera technique for a few scenes, although it's probably still the weakest of the four Bogart/Bacall movies. 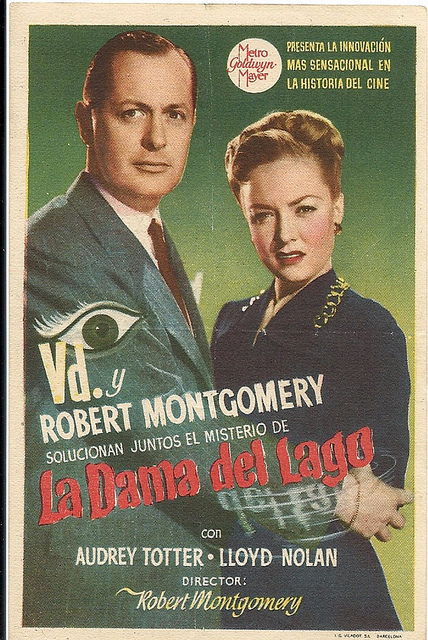 A Spanish poster for Lady in the Lake (1947). Lady in the Lake also presented a unique challenge for the actors. The entire movie breaks the fourth wall, so Montgomery usually sat in a basket under the camera while filming -- he wanted the actors to have a real person to interact with -- and he had to extensively rehearse with the cast. "Actors are trained not to look at the camera," he said in an interview with writer John Tuska. "I had to overcome all that training." Montgomery's techniques had mixed results. There are quite a few great performances in Lady in the Lake, especially from Ames as a nervous publisher and Lloyd Nolan as a crooked cop, but the standout is Jayne Meadows, who brilliantly impersonates three separate femmes fatale. On the other hand, Audrey Totter, who plays Marlowe's client/love interest, spends so much time arching her eyebrows and flaring her nostrils that she almost comes off like a Disney villain. Lady in the Lake was a hit in 1947, mostly thanks to MGM's unrivaled publicity department, which churned out advertising copy that exploited the subjective camera technique. The movie's famous poster blared, "YOU and Robert Montgomery solve a murder mystery together," while other ads featured great lines like, "YOU accept an invitation to the blonde's apartment," or "YOU get socked in the jaw." Today, Lady in the Lake is regarded as something of an oddity, and a failed experiment in the subjective camera technique. There are a lot of minuses -- jerky camera movements, the main character is a disembodied voice -- but I found that there was also a lot to like, especially Meadows' performance and Montgomery's innovative compositions in some shots. Lady in the Lake is available on DVD and video on demand. On first viewing it was difficult getting used to the subjective camera, but over the years "Lady in the Lake" has become standard issue Christmas viewing for me. Favourite line: "Imagine you needing ice." PS: Just loaned my copy of "Ride the Pink Horse" to my sister. I think we're heading into a Robert Montgomery period. I was really surprised by some of the harsh online reviews. This movie is a pretty decent noir. I think Montgomery took what he learned from Lady in the Lake and used it a much better way in Ride the Pink Horse. Great pick, Amanda! Lady in the Lake is not one of my favorite noirs, but I've always liked it, and you've made me appreciate it even more. I greatly enjoyed the information about the making of the film, as well as the details on Robert Montgomery, who's always been a favorite of mine. Thanks so much for this excellent contribution to the blogathon! Thanks for hosting the blogathon and including me! An excellent assessment of LADY IN THE LAKE. First, it's one of the best Marlowe novels, so it's a shame that it's a poor adaptation. Second, the first-person viewpoint, while technically interesting, grows weary quickly and becomes forced. You are right--Delmer Daves used it much more effectively for a large portion of DARK PASSAGE. The subjective camera is a tricky thing to get right and make it more than a just a gimmick but there's still a lot I like about this one including Totter's fabulous faces :) love the video you included. Thanks for posting on this one for the blogathon! I agree that this film is a bit awkward, but I admire the planning it took to stage and film the scenes. Your review has me curious to see it again, especially to see Audrey Totter's performance. She is utterly fab in this film. It took a lot of guts for Montgomery to do this for his first film, and probably a lot more planning than for a regular film. I've never actually seen this one so was interested to read your review. It's certainly a film where the reputation precedes the watching, if that makes sense?! Interesting to think that even then there was a certain amount of marketing involved in selling a film to the public. The marketing of movies back then is interesting. I'm writing an article about Ninotchka and MGM was worried people wouldn't go see the movie because of the unusual name so they came up with the tag line, "Don't pronounce it -- see it."